According to the USDA/NASS (http://www.nass.usda.gov/) for the week ending May 24, corn was 87 percent planted, which was 21 percent ahead of last year and 17 percent ahead of the five-year average. Across the state, corn is at a range of growth stages. Some of the corn planted in early May is showing up to three leaf collars but in later planted fields, corn is still emerging. Troubleshooting emergence problems early is critical in identifying solutions and developing successful replant plans, if needed. Here's a list of a few common things to look for if you encounter an emergence problem in corn this spring. (Some of this information has been adapted from a newsletter article written by Dr. Greg Roth, my counterpart at Penn State several years ago). -No seed present. May be due to planter malfunction or bird or rodent damage. 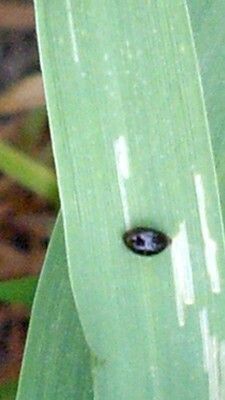 The latter often will leave some evidence such as digging or seed or plant parts on the ground. -Coleoptile (shoot) unfurled, leafing-out underground. Could be due to premature exposure to light in cloddy soil, planting too deep, compaction or soil crusting, extended exposure to acetanilide herbicides under cool wet conditions, combinations of several of these factors, or may be due to extended cool wet conditions alone. -Seed with poorly developed radicle (root) or coleoptile. Coleoptile tip brown or yellow. Could be seed rots or seed with low vigor. Although corn has just started to emerge or has not yet emerged in many fields, growers should carefully inspect seedlings for symptoms of disease, especially in lower lying areas of fields where ponding and saturated soils were more likely. Seeds and seedlings that are brown in color, are soft and fall apart easily while digging are obviously dead or dying. Seeds and seedling roots or shoots with white to pinkish mold growing on them are likely victims of fungal attack and will likely die. Pythium and Fusarium are common fungi that attack plants and cause these damping-off or seedling blight symptoms under wet, cool conditions. It is more difficult to diagnose disease damage on plants that also show abnormal growth caused by cold soil conditions or by crusting of the soil surface. However, dark, discolored roots and crowns, instead of a healthy creamish-white appearance, are typical symptoms of seedling diseases problems. So, it is best to check these seedlings very closely for dark brown or soft areas on seedling roots and shoots. Any discoloration will indicate a problem that could worsen if the soils remain cold or wet. - Seed has swelled but not sprouted. Often poor seed-to-soil contact or shallow planting- seed swelled then dried out. Check seed furrow closure in no-till. Seed may also not be viable. -Skips associated with discolored and malformed seedlings. May be herbicide damage. Note depth of planting and herbicides applied compared with injury symptoms such as twisted roots, club roots, or purple plants. -Seeds hollowed out. Seed corn maggot or wireworm. Look for evidence of the pest to confirm. -Uneven emergence. May be due to soil moisture and temperature variability within the seed zone. Poor seed to soil contact caused by cloddy soils. Soil crusting. Shallow planting. Other conditions that result in uneven emergence already noted above, including feeding by various grub species. Don’t forget that corn may take up to 3 to 4 weeks to emerge when soil conditions are not favorable (e.g. temperatures below 55 degrees F, inadequate soil moisture). This was widely observed in many fields in 2005 when corn planted in mid April did not emerge until the first or second week of May. As long as stands are not seriously reduced, delayed emergence usually does not have a major negative impact on yield. However, when delayed emergence is associated with uneven plant development, yield potential often reduced. The severity of the western Lake Erie cyanobacterial harmful algal bloom (HAB) is dependent on phosphorus inputs from March 1st through July 31st, called the loading season. This new experimental product projects the bloom severity based on the combination of measurements of discharge and phosphorus loading from the Maumee River for the loading season to date with historical records from past years to estimate the remainder of the loading season. Based on 10 weeks of data (March 1- May 3), the extensive severe blooms observed in 2011 and 2013 are not projected to occur this year. The current load is below that of 2014 at this time. However, there is still a large uncertainty in the projection because the loading season is only about halfway through. This uncertainty will reduce over time as the loading season progresses. This experimental product uses the Maumee River phosphorus load data from Heidelberg University’s National Center for Water Quality Research and the western Lake Erie bloom severity models by NOAA’s National Center for Coastal Ocean Science.